This recipe is a combination of Austin Leslie’s Fried Chicken recipe and my Mom’s. My Mom really taught me how to fry chicken well, she showed me how to turn it often to prevent over browning, and how to know when it’s done. She makes it so well that I often get cravings for it, like the one I had last night, and Dad says that it would be his last meal request if ever facing the firing squad. 3-4 lbs Chicken parts, I like legs because that’s what Mom always made, plus it’s hard to dislike food with it’s own handle. Combine the water with the salt, submerge the chicken and let sit in the refrigerator for 6-8 hours. This will help make the chicken more tender and add flavor. After the time has passed drain the chicken and pat dry with paper towels. Place the flour, salt, black pepper, and cayenne in a paper lunch bag. Mix well. Add the chicken two pieces at a time, shaking to coat well with the seasoned flour, shake off the excess. When all chicken is floured, set aside for twenty minutes before frying. This step will help make the finished product more crisp. Heat the peanut oil to 360 degrees F. Fry the chicken in batches, turning often (about every ten minutes) so that it cooks evenly, and doesn’t get too brown too fast. Try to fry equal sized pieces in the same batch. When the chicken looks close to being done hold it with tongs and pierce (be careful; the oil will sputter) with a carving fork, then squeeze to let the blood out (a la Austin Leslie). Cook until done. If you’re not sure if it’s done, dig into one piece with your tongs, down to the bone to see if it is cooked through. It should take about 15-20 minutes per batch. Drain on paper towels or a wire rack. Be sure and check out my ever growing Index of Creole & Cajun Recipes! Visit my other blog American Gourmand! Oh, you had to put that up! I have Austin Leslie’s recipe which I think I got through your site. Now I have you Mom’s too. I’m salivating already. I just prepared this recipe last night, with a few adjustments, and it came out absolutely divine. I am a N.O. expatriate and have longed for a chicken drumstick as good as Popeye’s for a long time… I think I finally found my substitute. The adjustments I made were primarily the salt amounts, which was originally because I was only making 8 drumsticks, but then also realized that 4 tabe’s is a heckuva lot of salt! I reduced it to 1 Tabe. Then 1 tsp of fresh ground black and a 1/2 tsp of cayenne. I think the sweat technique is a staple for me now. The bleeding is also a staple for me now. OH and the MOST important: salt water seasoning technique. I added 2 bay leaves and tabasco to the water as well… but only for 20 minutes and it worked fine. I pan fried (Veg/peanut/Veg Lard mix) it at a starting temp of 390 (due to the inherent temp drop) and then kept it steady at 350-360. 10 minutes on both sides and Wa-La! Perfectly seasoned, crispy chicken. No over browning or burning at all. Thanks for the kind words Sean, I’ve had a taste for some Fried Chicken this week also, I need to whip some up soon. Glad you found the recipe helpful, I will have to revisit the 4 Tbsp of salt, now that you mention it, it does sound like a heck of a lot. It maybe a typo. Danno, Congrats, you made the Saveur blog, http://www.saveur.com/index.jsp?page=2&order=1, as always, keep up the good work, ch (saturnbar). The 4 tablespoons of kosher salt is way too much (extremely salty) so I reduced it to 1 tablespoon. It turned out great and I’m glad I found this recipe. I had no idea that soaking chicken in salted water would make such a difference! 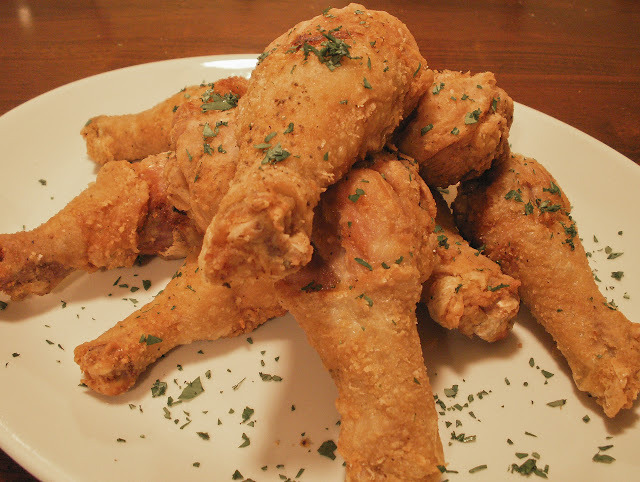 Thank you for the recipe and the helpful tips on delicious fried chicken!